It’s that time of year. Time to attend the company holiday party. It can be fun depending on the company. Some companies really know how to throw a fun party. Others will at least have good food. With the down turn in the economy, their budgets have gotten tighter, so both food and fun are less prevalent than in the past. But if you are the plus one for your spouse, S.O. or friend, it can be difficult. You rarely know anyone there. You are stuck in the middle of boring work related conversations or trying to find common ground with other plus ones. To my great delight, I was recognized by several steampunk fans and got to chatting about that. 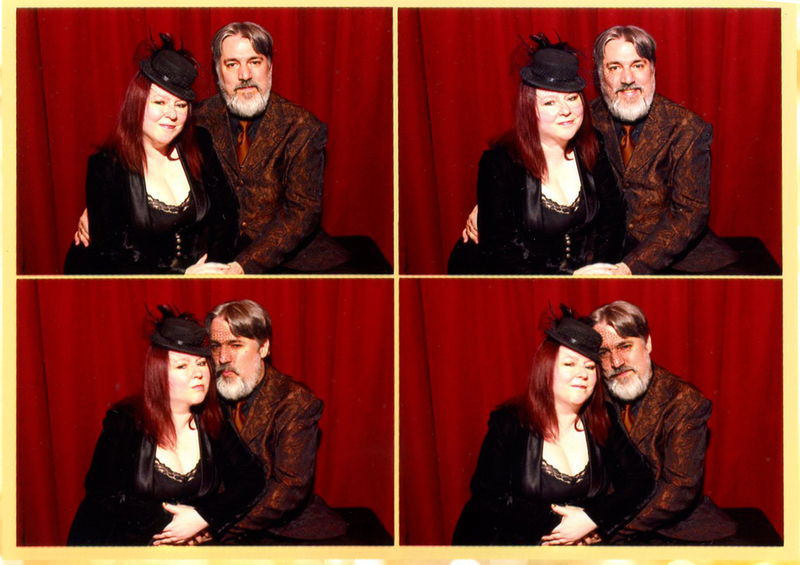 We even managed to find a few converts so we got to preach the word of Steamcon. The big conundrum for me was what to wear. I made the mistake of dressing up too much in the past, and feeling out of place. The invitation said it was a “Winter Circus” theme and cocktail attire is encouraged. That sounded wonderful. Right up my alley, but what to wear that won’t get me confused with the entertainment. Full on steampunk is probably not good. There’s memorable and there’s making a good impression on my husband’s co-workers. So I opted for a black velvet jacket, gold organza skirt and a small black hat. As we came in I was happy to note that the hat I almost wore was being worn by the fire performer. Whew. I got lots of compliments on my cute, but not too over the top hat. Then the two girls on stilts came over to let me know they were wearing the same hat! Lol! Oh well. I got a cute photo with them. The atmosphere was very fun. They had made up Union Station into a circus tent. There were lots of wandering performers and an aerialist rig in the center. Contortionists, a juggler, a magician, a numerologist and more! The food was tasty and the bartenders were skilled, so we had a great time. The music got louder and it became hard to carry on a conversation. The music was very eclectic. People did dance though. 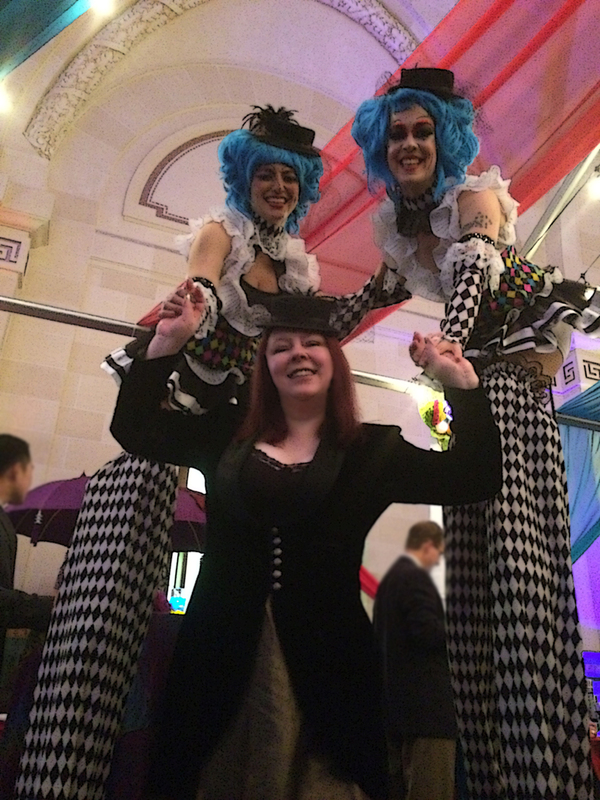 In fact one of the stilt walkers came back over and asked if I was dancing, so I danced with her. It was a very odd but fun experience. She even got me to twirl a few times. I was wishing I had worn more danceable clothing. Next the pretty little mime came over and did some mirroring with me. I felt that I did pretty well at keeping up with her. My only complaint would be that they had a candy and flavored popcorn instead of real desserts. I have to admit that it did fit the theme and was easy to eat, so it worked. All in all, kudos to the people putting it on. It was a great party and we had a great deal of fun. Sorry for my prolonged absence. Another Steamcon has come and gone and I needed a break after all the work of putting it on. I think it was successful. Everyone seemed to have a good time. You can get a glimpse at the fun in our Flickr group pool. We will begin work on the next one in January and I’ll be putting up the details as soon as we have them sorted. I am also trying to work on some of the projects that I have neglected in the past year, so hopefully I’ll be linking to many new things in the next few months. As many of you are getting ready for the holidays, I thought I might mention a few of my creations that would make good gifts. This is a small book filled with pictures using the idea of archetypes to figure out some interesting and different steampunk costume ideas for the ladies. This is a full color book of many of my whimsical animals in colorful costumes. 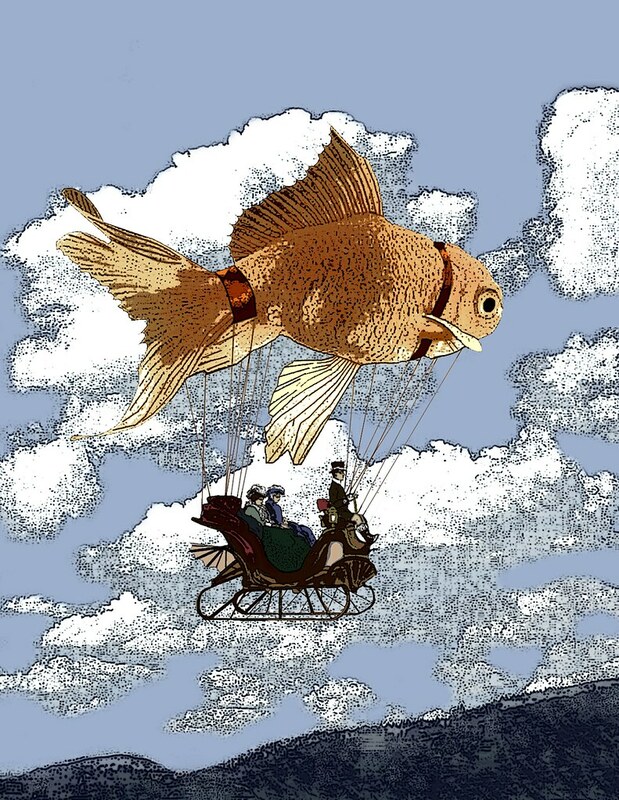 This is a design I made in response to some of the comments about my quote “Steampunk needs historical accuracy like a dirigible needs a goldfish”. You can get a mousepad, or several other things with this design. 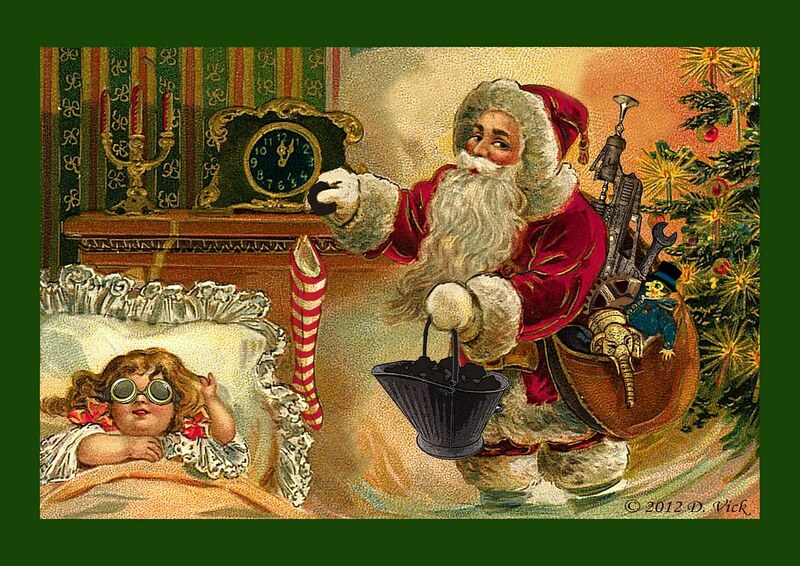 And lastly a steampunk themed Christmas card with an old fashioned feeling for your favorite steampunk.